Low-Fat powdered (instant) milk can be stored for many years if you use an oxygen absorber and an air tight container and/or mylar bag, so many people who store food for emergencies store this. It can be used to make an evaporated milk equivalent, ricotta-type cheese, sweetened condensed milk, caramel sauce, yogurt, sour cream, etc. Some of these aren't as good as the real thing but will do in a pinch, although I have to say the caramel sauce is awfully tasty. ;) It's nice to have some options in emergencies and hard times. You don't see powdered whole milk often, but there is a good reason. Products with fat in them don't store well. One thing to keep in mind is, you can "save" and "pin" as many recipes as you want on the internet; but if the power goes out for a long time, how will you get to them? It's a very good idea to copy basic recipes for the foods that you have stored. It may even be a good idea to practice making some of these things and will give you more confidence in it. I actually haven't stored any powdered milk yet because it seems so expensive, and I'm on a strict budget. 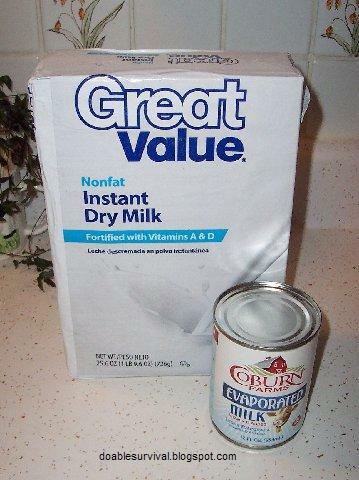 At least it seems expensive to me since you are buying a box of something powdered as opposed to cans of evaporated milk for around 75 cents each. Then I thought, well silly girl, that could be one of your projects! Crunch the numbers and figure it out! Powdered milk is $7.78 for a small box (1 pound & 9.6 ounces) here at Wal-Mart. I live in a small town area, so we don't have a lot of big warehouse type stores or discount stores. I normally only buy powdered milk to make a copy-cat toffee cappuccino recipe to stretch out the store brand cappuccino that I like to buy. I don't drink white milk (just don't like it); so, if I have a recipe that calls for milk and don't have it in the house, I just use evaporated milk (1/2 water and 1/2 evaporated milk). Also, I live 30 miles from where I buy my groceries, so it's nice to know substitute recipes I can use in a pinch. As usual, there is conflicting information on the shelf life of non-fat powdered milk. From what I've read, if stored properly in air-tight containers and/or mylar bags with an oxygen absorber, it can last anywhere from 10-25 years, which is a long time either way. Evaporated milk is supposed to be good for 1-2 years but is thought to be good for at least several years in an emergency situation. The taste just wouldn't be as good. You would have to use your own judgment. So, I crunched the numbers. The box of powdered milk in my area, as I said above, is $7.78 for a small box, and a can of evaporated milk is around 75 cents (Not sale prices. Of course it's better when you can get it on sale). Anyway, if you use the powdered milk to make 1-1/2 cups of evaporated milk (equivalent), which is how much is in a can of evaporated milk, it came out to about 73 cents, so about the same price BUT powdered milk lasts much longer in storage. I like the evaporated milk much better for recipes, but I should start storing some powdered milk too. FYI, 1 cup of milk from powdered milk is about 24 cents. 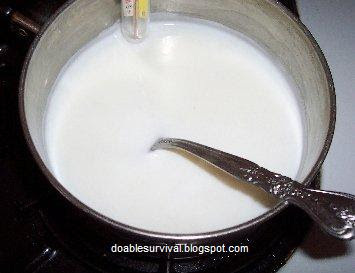 Combine the water and powdered milk in a pot. Cook on low to medium heat, stirring occasionally, until it is hot but not scalding, about 120 degrees. Take it off the heat and mix in the vinegar. Let it sit for a few minutes, and the curds will separate from the liquid whey. 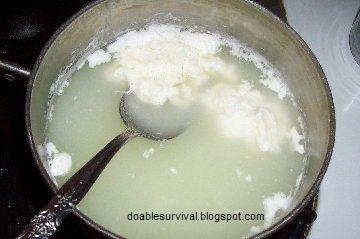 Strain it and rinse the curds under cool water. 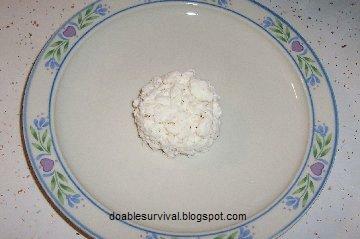 To make a kind of cottage cheese (ish), just add more milk back into it to make it creamy. Bringing it up to about 120 degrees. Mixed in a little milk to make it a cottage cheese consistency. Blend in a blender until creamy or with a hand mixer. I continued on and made it into caramel anyway. 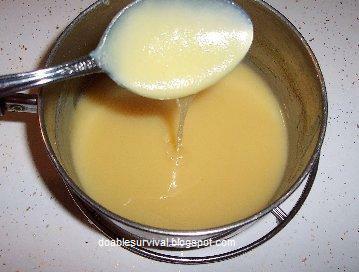 Just make the sweetened condensed milk above and boil down, stirring constantly, until it thickens. For me, it took about 10 minutes. Note, it will thicken more as it cools of course. so I'll cook it a little less next time. "Butter" from Dry Milk? ....not so much. I found this recipe for it and was really hoping it would work well as I love butter. I thought, in an emergency situation, if you had powdered milk stored but was out of butter and just wanted something with a buttery taste and consistency to put on your food, you could do this; but it didn't work well. I tried 1/2 a batch and it wouldn't thicken. I tried it again, just 1/4 batch since I didn't want to waste the ingredients, and used just a little less water and oil; and even after beating it with the electric mixer on medium for 15 minutes and then on high for another 5 minutes, it wasn't even as thick as sour cream and didn't taste very good. To be fair, I didn't have the butter flavoring to add; but still, I don't think it would we worth the while. That was with the electric mixer too, not the hand mixer if the power was out. Also, I tried to search for other recipes like it and didn't see much; so that's another big red flag to me that it doesn't work very well. 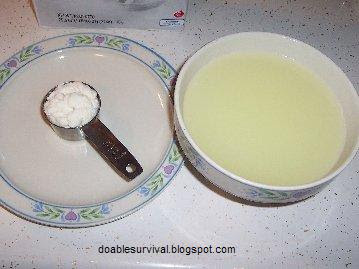 You can try it if you like, 3/4 cup powdered milk, 1/3 cup water, 1/4 cup oil. Food coloring, salt, and butter flavoring optional. another 1/2 cup of the powdered milk. For the quart of reconstituted milk (1 cup is 1/3 cup powdered milk and 7/8 cup water), so measure out 1-1/3 cups of the powdered milk and add enough water to equal a quart or 4 cups. Mix in the 1/4 cup yogurt and let sit in a warm area (80-110 degrees) for 6-8 hours. Then, chill. 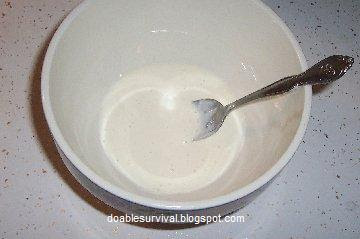 This can also be used as a sour cream substitute or to stretch mayo. 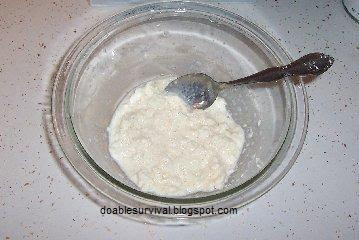 Make the yogurt above and let drain overnight in cheese cloth or other cloth (an old clean T-shirt). This can be used to substitute for cream cheese or thick sour cream. Measure 1/2 cup of water into a large bowl and put in the freezer. 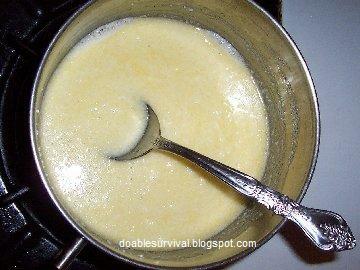 When ice starts to form around the edges, take it out and add 1/2 cup powdered milk. Whip it with a hand mixer (hopefully the electric is working or use a manual beater) until light and fluffy. Then add 2 Tbsp of sugar, 1 tsp lemon juice, and 1/2 tsp of vanilla. Beat until it is a consistency you like. I always make my own buttermilk when a recipe calls for it simply by adding some vinegar to milk. You can also do this with milk made from powdered milk. Stir in the vinegar. If you have store-bought buttermilk and want to stretch it further, mix 1/2 cup of the store-bought and 4 cups of reconstituted powdered milk and let it sit at room temperature overnight. Then refrigerate. Mix together the dry ingredients and then add the vanilla and a little of the water to dissolve and mix it well and then add the rest of the water and stir. You can heat a cup of reconstituted milk and stir in a spoonful of molasses or add a spoonful of honey or chocolate syrup or a couple drops of vanilla. Leave a comment or suggestion below if you would like. Not at all. :) Thanks. WOW! Thanks heavens for you .......I didn't have a clue about all these uses....MANY THANKS FOR SHARING!! I grew up drinking dry milk! My mom would make up a big pitcher. We loved it! We had digestive issues, but that's what we had! I remember having whole milk and couldn't stand it! 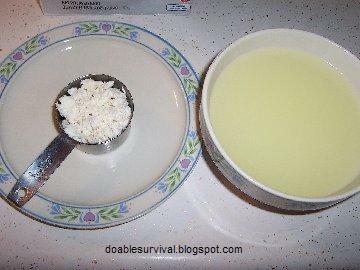 It is great for cooking and when you run out of reg milk. I've tried the fake butter with the butter flavoring and it still isn't that great on toast. To me youbcould still taste the powdered milk flavor. However I did use it to make biscuits and they turned out great. One problem with the fake butter is it does spoil in just a couple of days, chilled or not. I'd make it again to bake with but that would be to save my good butter. We made it for our kids when they were little. Try making it the night before using slightly warm water, it dissolves the powder easier. Then in the morning you have nice cold milk. We also had strawberry and chocolate flavoring that the kids could use to make it taste better. They never complained. We sell skimmed Aavin Milk Powder in retail. Aavin produces more than 75 tonnes of milk powder every day. Aavin Milk federation is also using it for producing it for more than 75 tonnes of milk powder each day after distributing milk. Aavin Milk is available in abundance, there is plenty of milk powder available in stock, after the procurement price being increased last year. Aavin Milk Powder is available at 160 per 500g.